NorthSouth Books (publisher of one of our favorite series - Rainbow Fish!) is just releasing a new series of books for little ones. 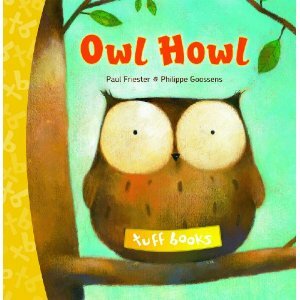 Labeled "tuff books" - these hard back, glossy paged stories are designed with young children in mind. They are "tear resistant, easy to clean and completely safety tested and approved for tiny tuff readers!" 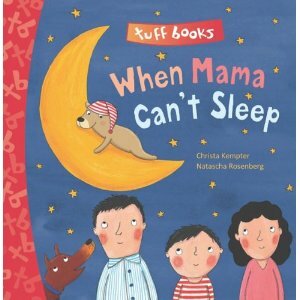 When Mama Can't Sleep was originally published in Switzerland under the title Alle sind wach. (I thought that was interesting at any rate.) This book, I have to honesty say, was our least favorite. The reason I didn't care for it is because it features a ghost and we have not really delved into the idea of ghosts around these parts. I cracked the book open with the boys by my side and just didn't mention the ghost in my reading. The main idea of this story is that each member of the family is unable to sleep on one particular night. The only way that they find themselves able to sleep is to crawl into one big bed together, whereupon they drift off into slumber land. We just really didn't connect with this one very much and preferred the other three to this. Rainbow Fish and the Whale was the book that attracted me to finding out more about tuff books to begin with! Being that Bookworm1 has really enjoyed some Rainbow Fish tales, I thought he would really enjoy this. We actually did already own a copy of this particular story so it was not all together new to us. 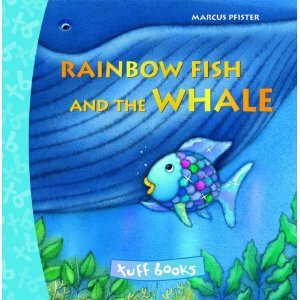 However, if you are interested in introducing your younger child to Rainbow Fish and friends, this tuff book is a good way to get going! In this story a gentle old whale enters into the domain of the fishy friends and through some misunderstanding, the fish are afraid that not only is the whale going to eat up all the krill in the area - but they along with them! A bridge of friendship is built by Rainbow Fish between the whale and the other fish and there is a happy ending -- for everyone but the krill, of course! We finished up our reading with Two Little Chicks which was a hit amongst all three of us. 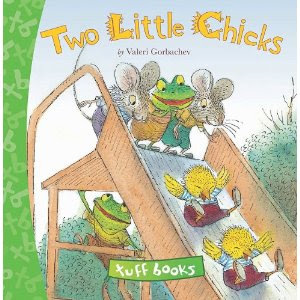 It tells the story of two little chicks who go to the playground for the first time and find a lot of other animals having a great deal of fun. The Little Chicks are too afraid to try any of the playground equipment and decline participation on a great many things until they are prompted to just try going down the slide. In the end, of course, they discover that the slide is plenty fun entertainment and nothing can stop them from making multiple trips down! Hmm. We may have identified with this book a little too much! That is also the great appeal of it - for us anyway. Bookworm1 has to be convinced that something is safe and fun before he'll give it a try. Bookworm2 throws himself headlong into anything with a "WHEEEEE!" and off he goes! They both liked different aspects of this book and mommy didn't mind reading it so everyone was happy. Do you think you and your youngsters might enjoy these books? If so, I'm happy to be able to offer TWO of you a set of each of these four titles. That's right! NorthSouth Books have offered up two sets of these books to two readers here at Reading to Know. Thank you, NorthSouth Books for allowing us a chance to becoming familiar with tuff books and for your generosity to the readers here as well! Wow! Thanks for this great chance! The boys would enjoy either of these! My boys would love these, please enter me. My kids would enjoy these! I also follow on FB, now! Oh, Carrie. I'm developing a mini library for my grandkids. I'd love to put these books on the shelf they can reach. These would great gifts for my neices. SIGH I love simply leaving a comment! It's about as easy as my day gets! oooooooh PLEAAAAASE pick me! LOVE this giveaway! These look great! I think I would donate them to our church nursery after we enjoyed them at home for a month or two. What cute books, they would be great to read. These would be great for my godchildren, too. Thanks!! All of the books look like great books. Thanks for the chance to win them. My guys are not always gentle with books so these might be good for us. The playground book looks especially fun! Out of all your giveaways, this is the one i'd like to win the most! My grandson would enjoy these. What cute looking books, all new to us! My daughter would fall in love with these books!